Jumping Squats is an effective exercise for building the quadriceps, hamstrings, gluteus muscles and calves. It also works the abdominal muscles and the hip flexors. Jumping Squats is an explosive exercise. It will help develop power, mobility and agility. Jumping Squats can be used as part of a High Intensity Interval Training program to improve conditioning. Assume a shoulder width position; feet slightly angled out. Keep your core section tight throughout the exercise. Descend to the bottom position of the Squat by bending at the hips; simultaneously raise both hands overhead. At the bottom position, the crease of your hips must be below knee level. Your knees should be over your feet. Maintain a flat back position; push your chest out slightly. Jump up by explosively pushing your heels through the floor. Extend your knees then drive your hips forward; your arms should be moving toward the side of your hips. Your feet should come off the floor as high as they can. Land squarely on your feet with knees bent, a slight forward lean and flat back. A common fault in Jumping Squats is starting the transition to the jump with both arms low and forward. You will not get enough drive and momentum with your jump. Another common fault is starting the jump on your toes and heels raised at the bottom position of the Squat. 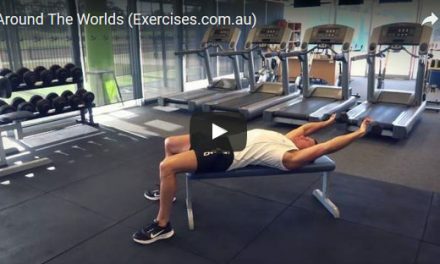 This will make the exercise inefficient; you will not be able to use the power of your glutes and hamstrings and more pressure will be placed in your quadriceps.